The sample code, which comes in an IPython Notebook, is based on Caffe, which is a deep learning framework developed by the Berkeley Vision and Learning Center. Deep learning is artificial neural networks that are made up of many hidden layers between the input and output. To use the tool, people will also need to set up NumPy, SciPy, PIL, IPython, or a scientific python distribution such as Anaconda or Canopy. The tool constructs an image it is given layer by layer, starting out with a basic outline and then adding more detail as it moves through the deep layers of the neural network. In that process, users can decide which layer they want to enhance, how many iterations they want to apply on its own outputs, and how far they want to zoom in after each iteration to create their own remix of the original image. 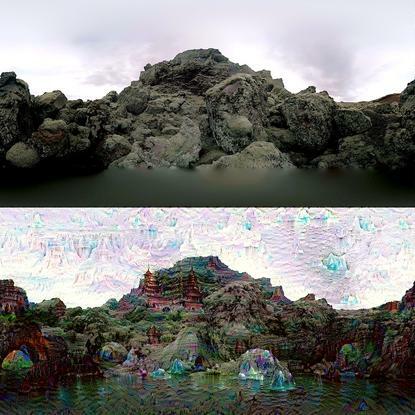 The Google software engineers open sourced their tool for research purposes and to see what kind of art others could produce using it. They are encouraging people to post their art to Google+, Facebook, or Twitter with the hashtag #deepdream.